Showing results for tags 'Parody'. The stars leaned down to bless you And I lied awake and missed you Poured me a heavy dose of atmosphere Cause I'll doze off safe, now Twily But I'll miss your arms around me I'd send a postcard to you, dear But I wish you were here I'll watch the night turn to dusk But it's not the same without fuss Because it takes a filly to get me up The silence isn't so bad Till I look at my hooves and feel sad Cause the spaces within my heart Is right where you fit on the Hub! I'll find some hope in new ways Though I haven't slept in two days Cause warm nostalgia burns me to the bone But without My Dear Twilight I'll sit on the park bench all night Waist deep in thought because when I think of you I won't feel so alone I won't feel so alone I won't feel so alone As many times as I breathe I'll think of you tonight ( Tonight, tonight, tonight...) I'll think of you, Twilight Your violet eyes get brighter And my wings grow lighter We'll taste the sky and feel alive again And I'll forget the world that I've seen But swear that you won't forget me Oh if my voice could reach back through screen I'd whisper in your ear: "Thank you for helping me!" [Pinkamena Diane Pie] Well, well, well, what have we here? Blueblood, huh? Oh, dear oh dear! So you're the one Rarity was talkin' about, -evil laughter- You're jokin', you're jokin' I can't believe my eyes You're jokin' me, you gotta be This can't be the right guy He's a fatty, he's ugly I don't know which is worse I might just bust a move now lf I don't die laughing first When Pinkamena Diane Pie says There's time is close at hand You'd better pay attention now 'Else you will go bad. And if you aren't shakin' Then there's something very wrong 'Cause this may be the last time now you hear a Pinkie song, ohhh [Assistant] Ohhh [Pinkamena] Ohhh [Assistant] Ohhh [Pinkamena] Ohhh Ohhh, i'm Pinkamena Pie! Well if I'm feelin' antsy And there's nothin' much to do I might just cook a special batch Of Pinkie's Gypsy Brew And don't ya know the one thing That would make it taste just right? A vile of some Blueblood to add a little spice [Assistant] Ohhh [Pinkamena] Ohhh [Assistant] Ohhh [Pinkamena] Ohhh Ohhh, i'm Pinkamena Pie! 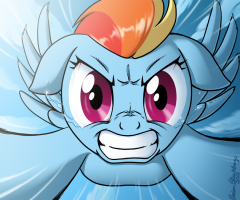 [blueblood] Release me now, Or you must face the dire consequences! I can give you whatever you want! So please, come to your senses? [Pinkamena] You're jokin', you're jokin'! I can't believe my ears! Could someone shut this stallion up? Best laugh I've had in years! It's funny, I'm laughing, You really are too much. And now, with your permission, I'm going to do my stuff... Blueblood: What are you going to do? Pinkamena: I'm gonna do the best I can, silly! (Musical interlude) [Pinkamena] Oh, the aroma of the cupcakes, Is like music in the air! 'Cause I'm Pinkamena Pie~ And you're taste I really do care! It's tastier, I must confess, When lives are put inside; Not mine, of course, but yours, my friend! Now you will taste just fine! [blueblood] Release me fast or you will have to Answer for this heinous act! [Pinkamena] Haha! You're funny! I'm laughing! You put me in a spin ! You aren't comprehending! The position that you're in! It's hopeless, you're dinner! You haven't got a prayer ! 'And just like all the others! You ain't going nowhere! A parody of the opening of the 1988 movie Heathers, starring Winona Ryder and Christian Slater. Let's get waaaaaacky at Pinkie's Playhouse. 1/6th of the entire drawing in progress. Done on Sketchbook pro. yeah, I'm just learning this program. And yes, Fluttershy is Chairy. I had fun coloring this one, although I had to experiment around a little. The first thing one may notice is that I kept the lines black instead of colorized, it seem to make more sense with the crosshatching and conveying intensity; at the very least that was my experiment's hopeful result here. It also made more sense to shade with this piece as it better portrayed the homage idea (normally as you have seen, pony art, at least mine, are flats usually, like on the show). The tears and bloody nose are also directly from the anime clip. (Removed the blood so the image is Gallery Safe - The unedited image is here *warning, minor blood*) Original Text: Rainbow Dash pushing herself to the very edge for speed. Inspired directly by this scene from the Redline anime. Rainbow Dash I see as a tragic character obsessed with being the best because deep down she has depression issues and fears of being seen as worthless.